Six Senses evokes tranquility, harmony with nature and a sense of space. The brand consistently fulfills its promise to the environment and to the surroundings and provides a uniquely warm and successful uniform experience across resorts. 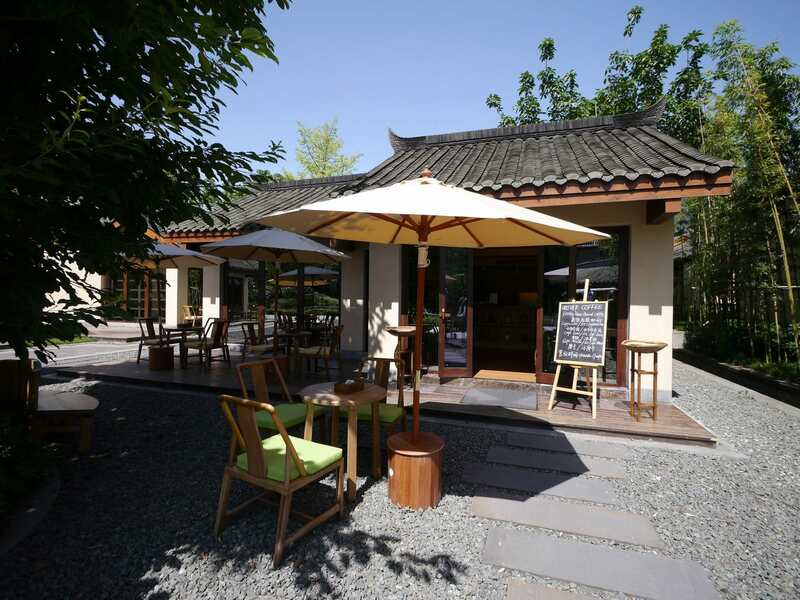 In UNESCO relisted Qing Chen Mountain, instead of the usual beach setting, the environmentally-conscious brand has opted for a more “central” location with plenty of activities to keep guests occupied, should they gather the willpower to leave the comfort of their suites and the resort’s tranquility. As I was planning my trip to Chengdu, ignorantly just to see the giant pandas, I read about the Six Senses Qing Chen Mountain Resort opening in the outskirts of the Sichuan capital and I could not resist a visit. What I found was a lush resort set in manicured gardens with the signature understated luxury of the Six Senses brand and, true to its core, in a location of incredible beauty. Instead of the usual beach and overwater villas of Oman, the Maldives and Con Dao, I was greeted by a refreshing and more affordable concept – duplex suites. The Six Senses Qing Cheng Mountain is the first of a new series of Six Senses properties focusing not only on plush standalone villas but also on a resort-friendly suites. The resort has been designed following the brand’s eco-friendly and peaceful village architecture. 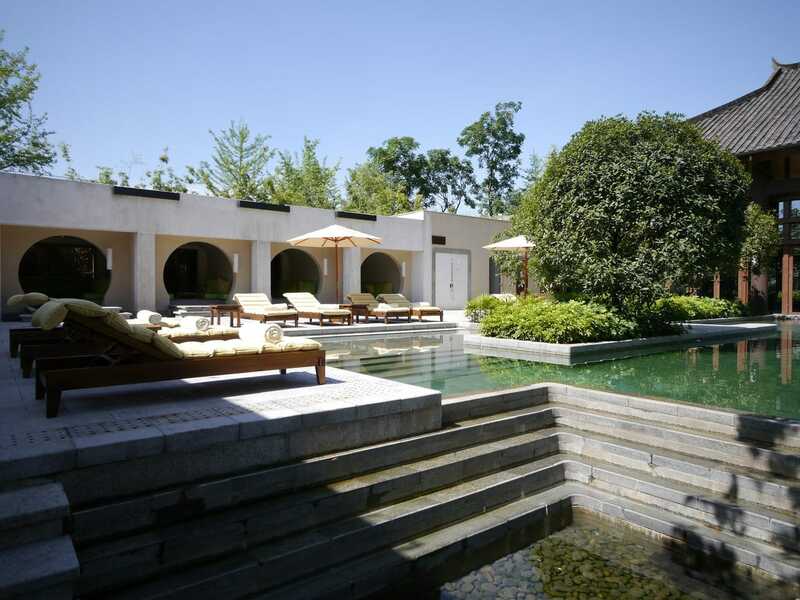 All Six Sense are organized around low-rise buildings, long tree-lined cycle paths and large private quarters. Deep care is placed in minimizing impact on the surroundings. Materials are native and sustainably sourced and the design blends in. The first Chinese property of the brand is no exception. What makes this resort unique is its accessibility. 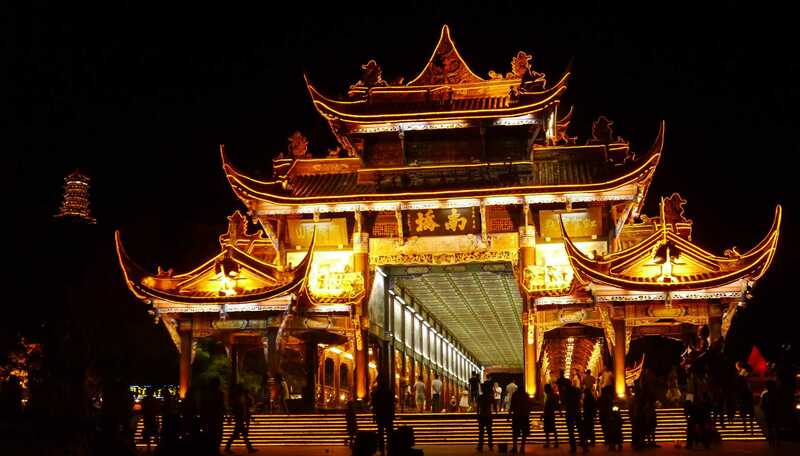 Instead of the usual remoteness (you can even paraglide into Oman’s isolated Zighy Bay), the Chengdu property is close to several UNESCO sites, places of interest, nature and, of course, the giant panda breeding centers, making it the perfect base to explore this culturally rich part of China. The 14m people capital is just over an hour away, but a distant memory. Thus, after first impressions, did the Six Sense Qing Cheng Mountain meet the expectations built over four previous stays with the Brand? I had been in touch with Olaf, the Customer Service Manager, via email before our arrival. We coordinated arrival details and organized activities. Since we were there for less than three days we wanted to make the most of it. Additionally, it was my friend and my birthday, mine, on the day of our arrival, so I had made a requests for a “special” dinner without specifying what exactly, I thought I would rather let the hotel surprise me. Olaf was at all times extremely useful and kind and he suggested a few activities outside of the regular published options that were more suitable to our taste and, for someone who had never met us, he suggested just what we would have done, should we had known. His correspondence was clean, swift and proactive and more useful than formal corporate jargon. All along, I felt I was dealing with a friend eager to show me the best, a very welcome approach to customer service. At the airport, the Six Senses driver was waiting for us and, since he did not speak English, he immediately called Olaf who welcomed us to Chengdu and explained how long it would take to get to the resort. We were soon on our way and about 75min later, we were entering the resort. The entrance is besides the parking lot. 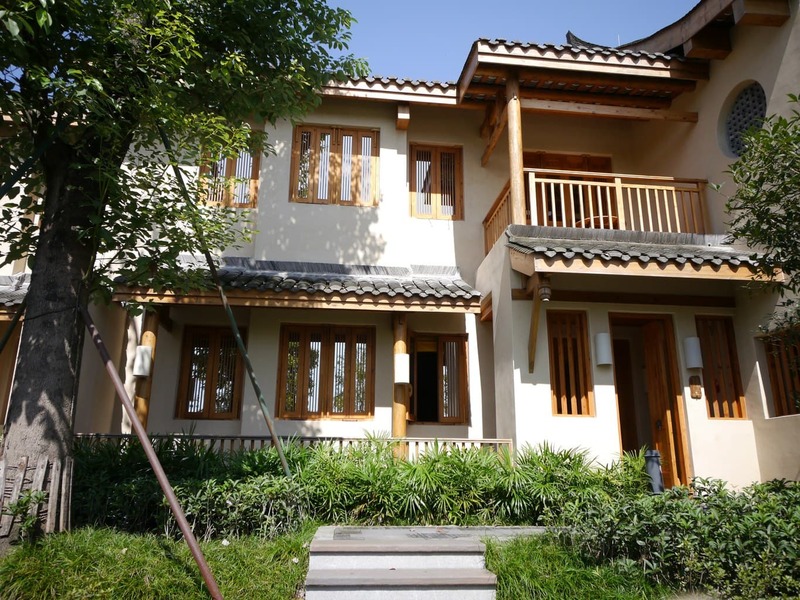 Since this is a resort accessible by car, many of the local guests who make up the majority of the clientele, drive from Chengdu for the weekend. We got out of our plush Mercedes 4×4 and onto a golf cart that drove up a small hill and into the reception through prettily lit bamboo gardens. Arrival procedures were efficient and little was required for check-in. We were given a refreshing glass of watermelon juice that disappeared within seconds. The staff noticed this and offered to top it up. The General Manager, Mike, greeted us while we were completing the formalities and after exchanging pleasantries, we were on our way to the suite. The lady who had done our check-in drove with us and gave us a tour of the room including basic instructions about how to work the wireless phone and the shower, pretty essential even to the best travelled person, we discovered the next day as we were trying to work the shower. The suites are found in two story chalet style buildings. 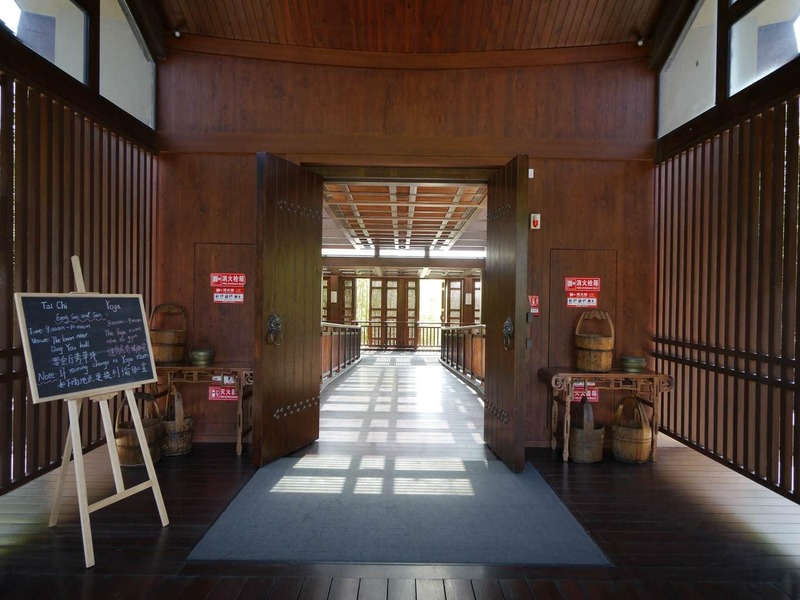 The ground floor suites are reached via a set of walkways and garden paths whereas the second story suites are connected via a maze of timber walkways flanked by bamboo leaves. Once you enter into your private space, there is a long veranda leading to your room. 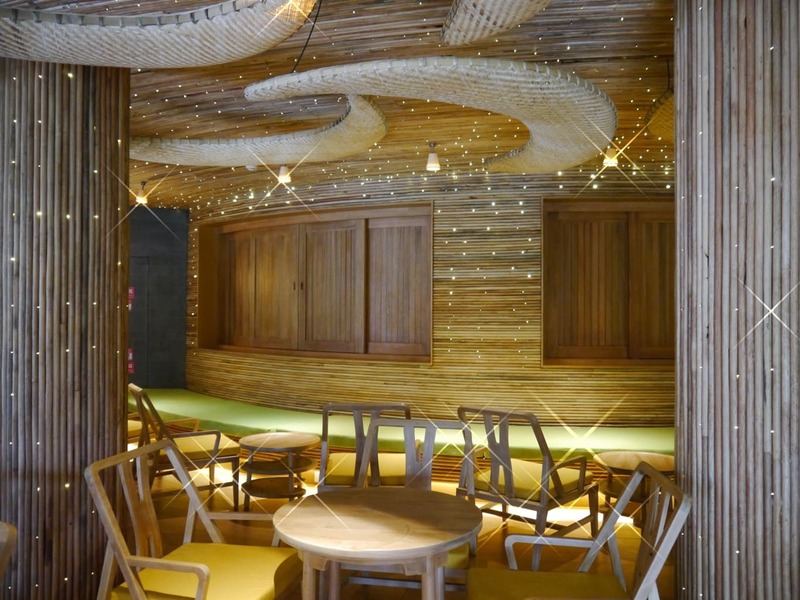 Having stayed at several Six Senses properties before, I was expecting the usual lime green and orange organic fabrics complementing light timber wood tones and I was not disappointed. It was like returning to an old friend’s home, I felt immediately in familiar territory. 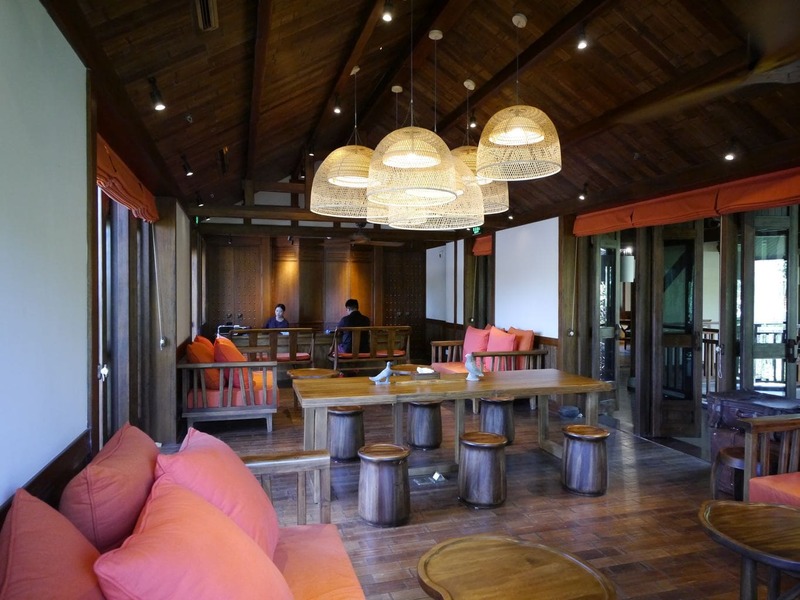 Six Senses achieves brand consistency in a surprisingly warm and soulful manner. The suites are tremendously spacious and well designed for privacy. The bedroom is large and features a signature double bed as plush and comfortable as you expect from luxury resorts. A mosquito net will protect you from any hungry bugs and, if you want to chill in your room, there are two sofas to do so. A TV is provided, but it is hidden, so you are less tempted to watch a movie than you are to observe the stars with a drink or read a book. A small balcony opens into the common areas and there is plenty of closet space to unpack your clothes. The bathroom is exquisite. 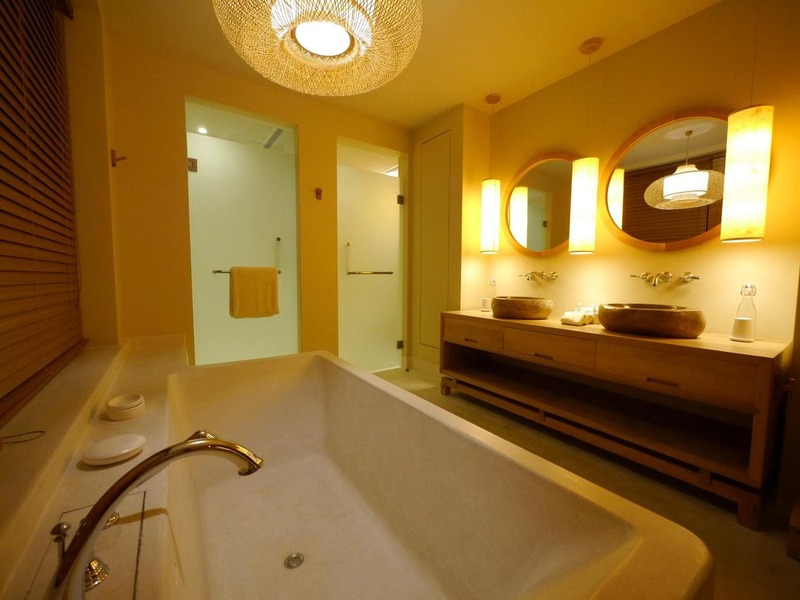 In front of the His and Hers basins, amenities and mirror, there is a large built-in bathtub to soak in after a long day tracking pandas, learning Tai Chi, exploring nature or immersing into the cultural wealth of Sichuan Province. Bath salts are provided. The shower is fabulous. A well replenished snack cupboard and minibar could satiate any pre-meal hunger and the espresso machine provides a good reason for an early morning sunrise. The room’s electrical controls can be managed through a wireless pad available in the room. There is no doubt a lot of care and thoughtfulness has been placed into designing the rooms following Six Senses philosophy and simple warm lines. The message tube, like in all other resorts, serves as a simple but classy way to receive messages from your concierge or the Customer Experience team, instead of finding envelops on the floor as you walk in. Although the resort is larger than usual, with around 100 suites, the usual Six Senses villa concept has not been completely dropped. A few two and four bedroom villas are available for booking. They have their own swimming pool and high walls to ensure full privacy from the rest of the resort’s guests. The villas are perfect for extended families or groups of friends. 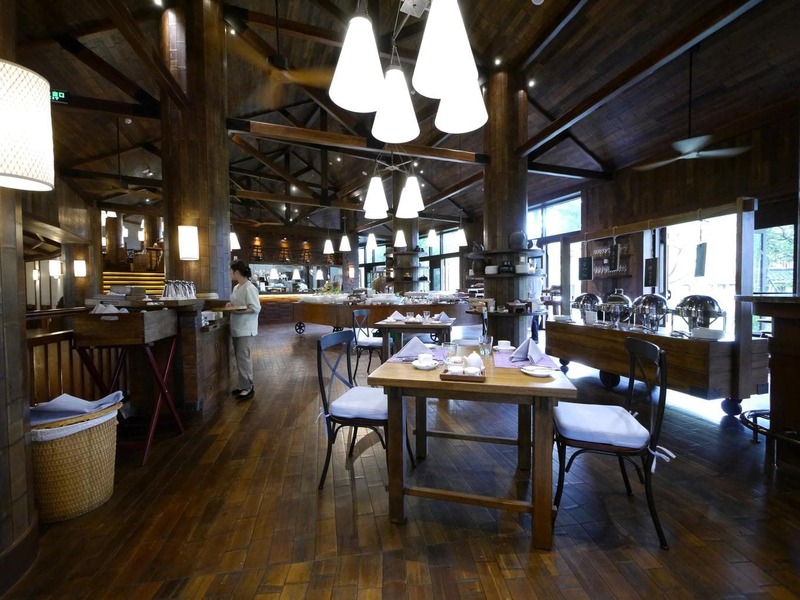 Six Senses is know for its emphasis on organic, local, sustainable and fresh food. 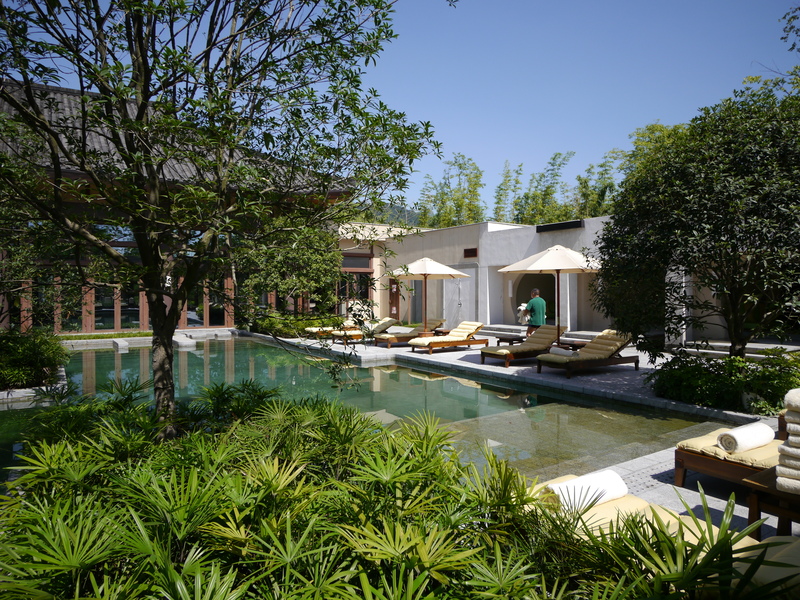 Gardens planted to grow the vegetables and herbs used in the kitchen are a staple across the brand’s resorts and, with the fertile and lush soil around Chengdu, the resort’s gardens are surely teeming with nature’s goodness. A sizable patch of land has been devoted to this and will be open to family activities soon. By the two main restaurants, zucchini plants threatened large fruits as the flowers were already in full bloom. At the time of our visit the Thai restaurant had yet to open but we sampled both farm2fork and 28Zodiac which were excellent choices and proof of what’s to come. A chat with Olaf and Conny A., Group Executive Chef for Six Senses Hotels Resorts Spas, revealed the resort’s focus on food. 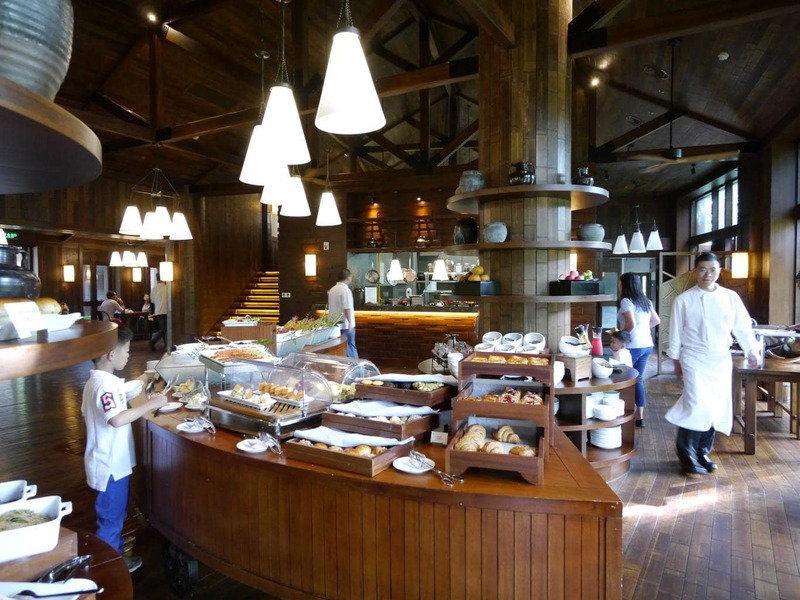 Much like with other Six Senses properties, food will be a major drawcard for many of the resort’s visitors. I always value the organic, responsible and locally-sourced spirit of the food in the Group’s resorts and the fresh and simple approach to preparation. I have had the pleasure of enjoying several foodie experiences across Six Senses Con Dao and the Six Senses Laamu, in the Maldives, so I am sure Qing Chen Mountain will provide a great insight into UNESCO-awarded Sichuan cuisine. Breakfast at Farm2Fork offered the usual fantastic spread. There were lots of freshly cut fruits, freshly squeezed juices and all the pastries and breads that make me so happy in the morning. The pancake and waffle station was a sweet way to complement the usual “eggs your style” options. Chinese customers, the largest group visiting the resort, were well catered for with lots of options including noodles, rice porridge and other condiments. Gluten free options we also available. A selection of cheese and cold cuts was a nice addition. The space is functional and simple yet manages to convey a friendly and warm feeling thanks to the use of soft woods. It was a great way to kick-start the busy days in the area. 28Zodiac, the Sichuan and Chinese restaurant, is a great initiation into local cuisine. Following the Group’s fresh and light recipes, we tried out a few of the usual, but not to be underestimated, options as per the recommendation of the waiter. The pork strips that are so famous in Sichuan were the best I tasted in our visit. They were smokier than usual and decidedly less oily concentrating all the flavors in the thin slices of rich meat rather than on the frying oil. The vegetables we ordered plus the second most famous dish in Sichuan cuisine, the Kung Pao chicken, were delicious, more refined and lighter than the street versions. The menu was long enough to provide enough options never to get bored. But it would be a shame not to try the authentic restaurants in town while you are at the Six Senses, at least once. 28Zodiac offers an a La Carte menu with a smart interpretation of some old time Sichuan favorites bringing them back in a modern approach including local flavors from in and around Qing Cheng Mountain area. The fairytale Moon Bar, whose ceiling is dotted with tiny LED lights resembling a starlit sky, has a fantastic atmosphere. The rooftop bar, once open, will provide great views over the resort and onto the majestic mountains behind. For those looking for life’s indulgences, there is a coffee place and an ice cream shop. When you check-in, you are given an ancient Chinese coin to exchange for an ice cream, a very nice and personal touch. Tea is also served at the Tea Lounge and, should you prefer privacy, Villa guests can enjoy a meal in the quietness of their villa. The resort’s focus on food will not stay at the restaurant level. The chefs will be at hand to show guests the organic garden and guide them in picking fresh veggies. Interactive cooking class will teach guests how to enjoy their favorite Sichuan recipes at home. And trust me, you will want to. The sessions will not be held inside the kitchen but will also be available in the Secret Dining area. The Secret Dining concept is one I loved. It had not yet started when we visited but Olaf told us all about it. The idea is that high-end dining experiences for up to 6 people will be possible at secret locations. The perfect surprise dinner for a romantic proposal. One thing is true, food will be centerpiece at the resort. The resort is well equipped for summer and winter holidays. Both indoor and outdoor swimming pools are heated and next to each other. The outdoor swimming pool is in a little oasis of peace. Set in a courtyard and surrounded by trees, it is hidden from view. The various cabanas on either side are a welcome respite from the hot sun, on the days when it decides to rise above the mystical fog. The indoor pool is designed for swimming. A long stretch of water perfectly laid out for that early morning exercise. There are meeting rooms and facilities for companies looking for a retreat with plenty of outdoor space to enjoy nature. Although we did not get to try the spa, as it had yet to open during our visit, the Group’s Spa Trainer was at hand to explain the resort’s focus on local treatments like cupping and Chinese reflexology. The spa is designed around waterfalls and nature, fully blending into the mountain’s landscapes outside of the hotel. As Six Senses Spas around the world, I am sure it will not disappoint. 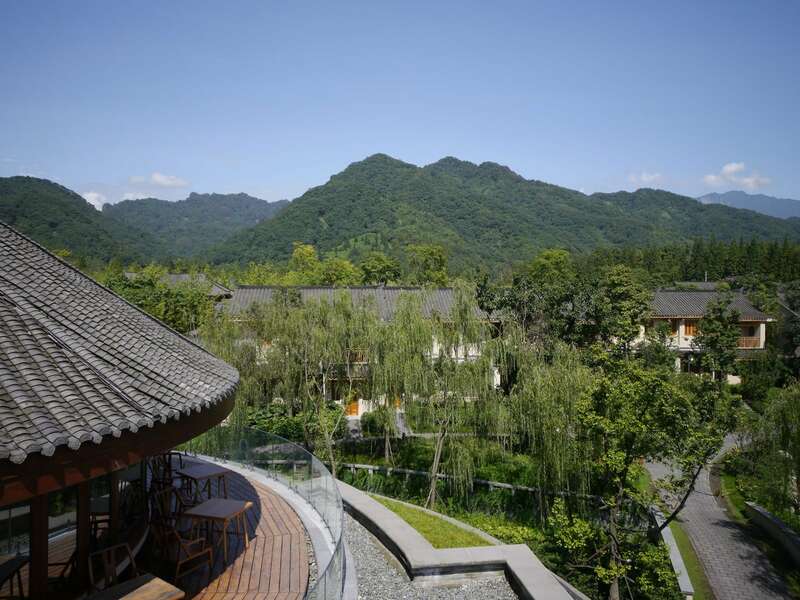 Contrary to other Six Senses properties, the Qing Cheng Mountain Resort offers a wide range of activities and experiences in and around the resort. 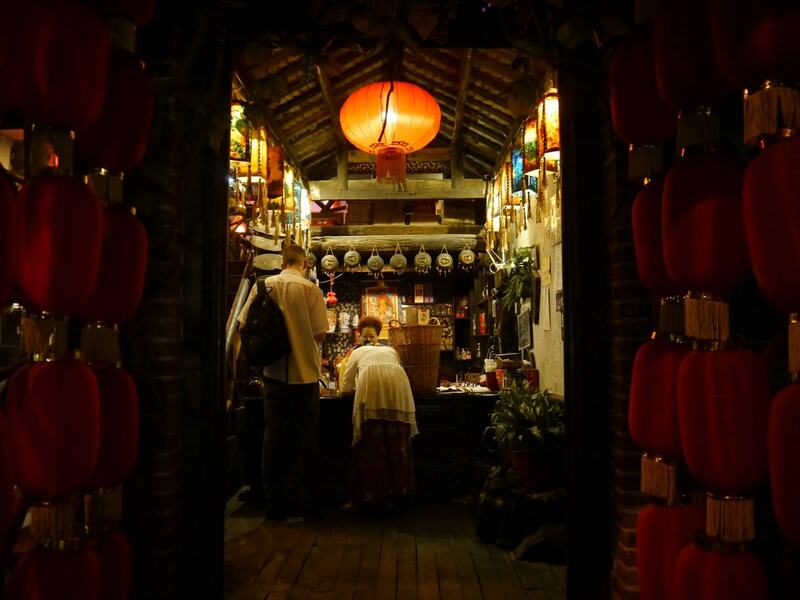 With a privileged location away from the urban buzz of Chengdu and close to the main areas of interest, most of the famous sites are nearby. Various Panda breeding centers are less than half an hour away, including exclusive sanctuaries not open to the public. Olaf came with us on our trip to the Panda centers which was a fantastic way to hear more about these creatures whose existence was only discovered in the 1950s. The resort’s links with the local giant panda organizations provided unique encounters and near-solitary opportunities to watch these fascinating animals in the wild. As opposed to joining one of the crowded tours to the more popular breeding centers, Olaf took us to some hidden gems and we could observe them in relative peace. His experience working with giant panda organizations before was very handy to answer all of my silly questions about their habitat and their endangered status. If you, like me, went to Chengdu just to see the giant pandas, you will be positively surprised by the amount of activities available besides watching these gentle bears. 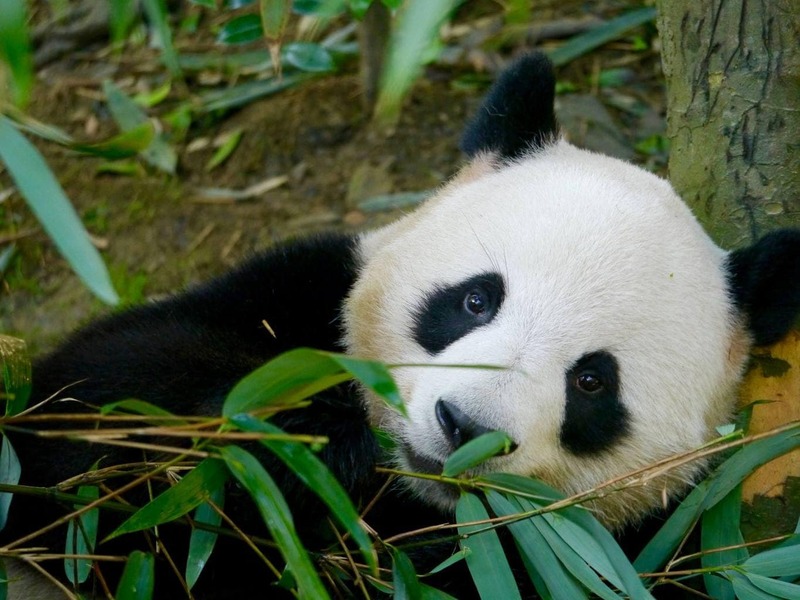 The resort offers trekking excursions into Qing Cheng Mountain‘s panda habitat although, we were warned, seeing one in the wild is practically impossible and the reason why they were only discovered in the last seventy years. The mountain was extremely popular among locals on the Saturday. Aside from nature, there are many enriching cultural experiences the resort can organize. 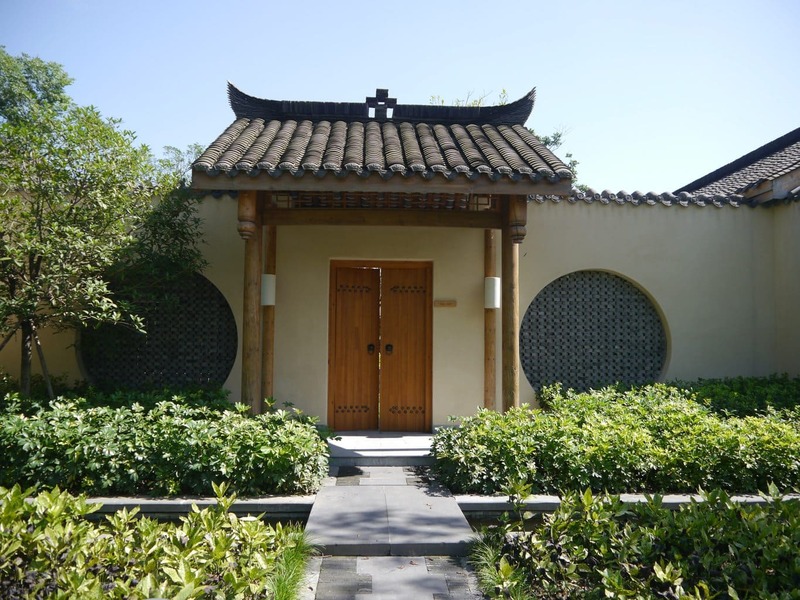 The area is the birthplace of Tai Chi, a therapeutic exercise that combines kung fu and qigong breathing, and the resort can organize a lesson with a master Tai Chi as well as visits to see the temple where it all began. Sichuan is partially located on the Tibetan Plateau, a culturally rich part of China. Aside from visiting the heritage city of Jiezi, another incredible way to experience ancient China is to drive to the Qiang Village, up in the mountains. The village was badly affected by the 2008 earthquake but, as a result, it has emerged as a center for cultural tours by the Qiang Minority. The village showcases the belligerent mastery of the group at defense and war. The houses are made of passages, labyrinths and basement canals devised to stall and harm attacking enemies. The entire village is absolutely fascinating and the journey, if a bit long, a wonderful way to explore the mountainous countryside. Up in the hills, atop the wind towers, one can’t help but feel the weight of time and the wisdom of this age-old culture. From the resort, a visit to Dujiangyan, another UNESCO listed site, and its irrigation system, in full use till today, 2,000 years after its construction, is a must. The city has to be explored at night, when the bright lights illuminating the bridges, canals and temples give the place a magic aura. Chengdu is recognized as a UNESCO “City of Gastronomy” so, if Sichuan food is what you are after, the resort will offer cooking lessons with an expert, the chef’s table for private meals and a long list of food-centric activities aimed at showcasing the region’s exquisite delicacies and unique recipes. This is reason enough for me to return. Last but not least, one can also enjoy yoga and Tai Chi at the resort, daily lessons are offered free of charge. 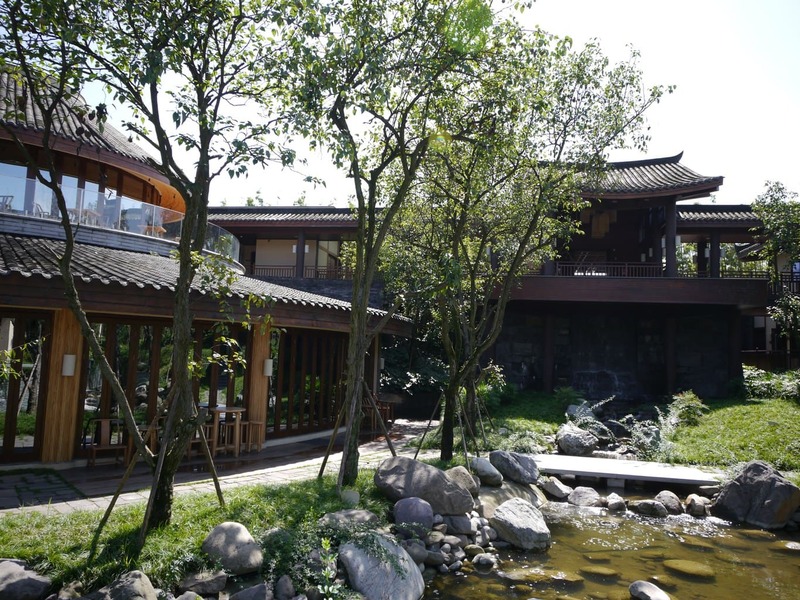 I will admit that, visiting a resort before its official opening is risky business, especially in China, where English-speaking staff are hard to come by, but I was deeply surprised by the hospitality, the warmth and the friendliness of everyone at the Six Senses. From the Resort Manager to the Receptionist, the staff was attentive and genuine, something that is impossible to master and hard to teach. They were interested in providing the best of experiences and nothing was too difficult. Needless to say, Olaf, the Customer Services Manger, was at hand at all times and frantically working 24/7 to make sure every guest’s plans were running smoothly and everyone had a smile on their face. As the resort features the new suites format, the Guest Experience Managers or GEM, that are in charge of every guest’ whims at other Six Sense are not available to the suites. Truth be told, I did not miss them. I will only say once thing: I will return. I left the resort regretting not having spent longer there. Part of me wanted to spend a day with the giant pandas, the other part wanted to explore nature more. And my stomach wanted me to come back and immerse myself in the depth of s and the Six Senses food experiences. Either way, Six Senses Qing Chen Mountain is a great addition and a golden reason to skip Chengdu and head for the mountains. Once in a Lifetime Journey was a guest of Six Senses Qing Chen Mountain. As always, all opinions are our own.